And after last week’s news that Tooting were getting their own town centre police team comes the news that Clapham Junction is getting one too. I had known it was coming, but had understood it was some time away. In fact, I’ve now been told the police team will be starting within the next month or so and will consist of 1 police sergeant, 2 constables and 8 Police Community Support Officers. 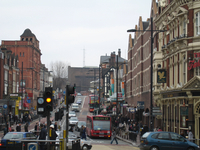 Like Tooting, Clapham Junction was an area we’d asked Labour’s Len Duvall to consider for a dedicated town centre team, but had been knocked back despite his positive statements in a public meeting held in Wandsworth. But also like Tooting, things are thankfully different under a Boris mayorality. I’ll obviously provide more details on both as I get them.